This photograph has been scaled down; full resolution photograph is available here (991 by 737 pixels). WAR TOURIST SEE THE SIGHTS, NO CAMERAS PLEASE! SPONSORED BY WORLD TOURISM ORGANIZATION OF THE COMMUNIST PARTY FAR EAST... HEROES OF THE SOVIET UNION. THE RUSSIAN SOLDIER WAS TOUGH, AND LIVED UNDER HARSH CONDITIONS. MOST SOLDIERS WERE LOYAL TO MOTHER RUSSIA RATHER THAN TO THE COMMUNIST PARTY. MANY HOPED TO GO HOME TO A MUCH BETTER LIFE AT WARS END, MANY WOULD BE DISAPPOINTED... LET'S TAKE A LOOK AT WHAT THESE TROOPS HAVE BEEN ISSUED. 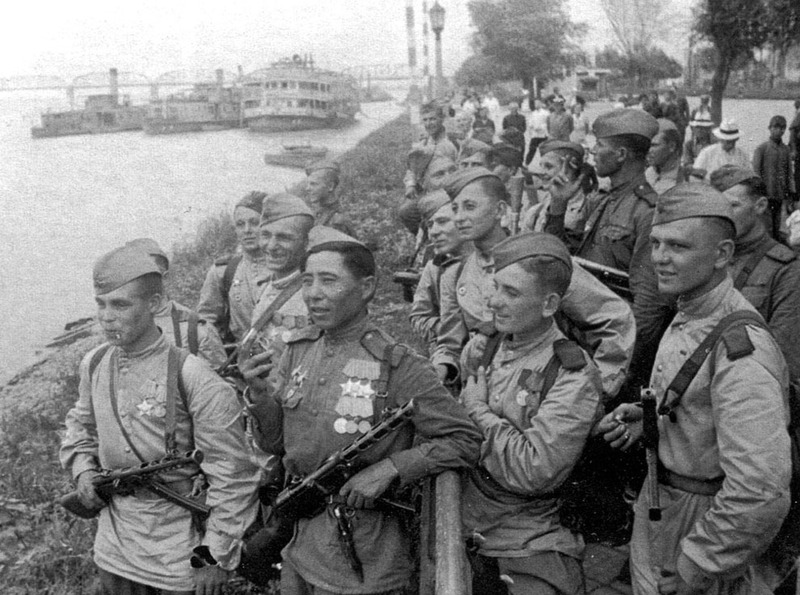 ARMED W/PPSh-41 SUB MACHINE GUNS, UNIFORMS LOOKS LIKE THE M43 SUMMER FIELD UNIFORMS CALLED A RUBAHA W/STANDUP COLLAR, HEADGEAR IS THE M35 PILOTKA SIDECAP, THE SOVIET SOLDIER, WORE HIS AWARDS AND MEDALS ON HIS COMBAT UNIFORM, MANY OF THESE MEN HAVE BEEN AWARED VARIOUS MEDALS FOR VALOR. SHOULDER-BOARDS ARM OF SERVICE COULD BE THAT OF INFANTRY(RED)IN COLOR, RANKS ARE THOSE OF OF PRIVATES AND CORPORALS.